NETWORK FINALS: There were no changes from this morning’s preliminary numbers. CABLE HIGHLIGHTS: ESPN’s NBA doubleheader was at 0.83/0.73. VH1’s BLACK INK CREW dipped 0.03 to 0.48. On Discovery, a special episode of GOLD RUSH was at 0.44. leading in to the premiere of BORDER LIVE at 0.22. Comedy Central’s SOUTH PARK dropped 0.07 to 0.43. 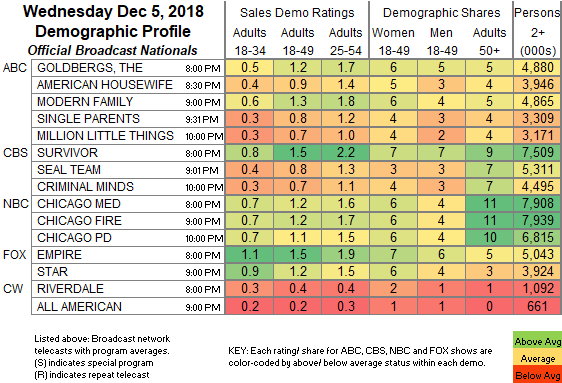 A Wednesday edition of A&E’s LIVE PD was at 0.42. 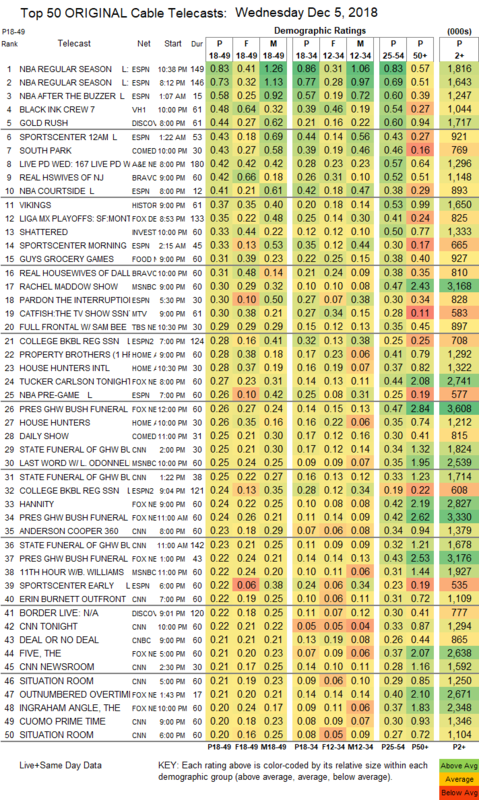 On Bravo, REAL HOUSEWIVES OF NEW JERSEY ticked down to 0.43, and REAL HOUSEWIVES OF DALLAS was up 0.05 to 0.31. History’s VIKINGS fell a tenth to 0.37. Fox Desportes’ LIGA match was at 0.35. On ID, SHATTERED was steady at 0.33. Food Network’s GUY’S GROCERY GAMES gained 0.05 to 0.31. MSNBC’s RACHEL MADDOW SHOW led cable news at 0.30/0.47/3.2M, with Fox News’s TUCKER CARLSON TONIGHT at 0.27/0.44/2.7M, and CNN’s afternoon coverage of the George H.W. Bush Funeral at 0.25/0.34/1.8M. MTV’s CATFISH rose 0.05 to 0.30. TBS’s FULL FRONTAL returned at 0.29. On HGTV, PROPERTY BROTHERS climbed 0.07 to 0.28, HOUSE HUNTERS INTL gained 0.04 to 0.28, and HOUSE HUNTERS was up 0.02 to 0.26. Syfy’s NIGHTFLYERS ticked down from Tuesday’s episode to 0.08.